Production during 2008 was divided into 2 categories: Major Projects and 3-D Studies. 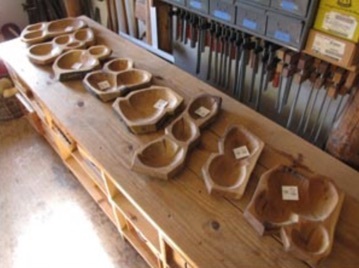 Eight Major Project bowls were created. All had multiple hollows. Four of these explore the new concept of “merged hollows” – these are multiple hollows that are partially joined at their sides. The wood for the 2008 bowls is from 3 sources. Numbers 1 and 2 are carved from Vermont butternut. The blanks are half sections of a Windsor chair seat plank given to me by Dave Sawyer, probably around 1984. Number 6 is northern Mississippi sassafras. This elongated 3 hollow server is an endgrain seat blank cutoff. It comes from the same collection of sassafras used for all of the 2007 bowls. 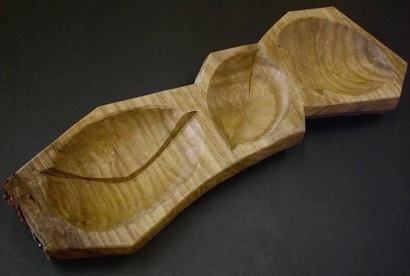 The remaining 2008 bowls are carved from air-dried butternut from middle Tennessee. In 2008 I began to focus more attention to the vertical sides and the undercuts that join the sides to the bottom. In these areas I experimented in creating what might look like random semi-geometric crystalline planes. As I developed this concept I was partially inspired by contemporary architectural forms, particularly the work of Ted Geary. Also, in 2008… During a month-long visit to Japan I was introduced to the 20th century Zen rock gardens created by Mirei Shigemori in and around Kyoto. As a young man Shigemori studied hundreds of traditional rock gardens, many at famous Buddhist temples throughout Japan. In his gardens he created visionary work that was very contemporary, but, as with much great art, also deeply connected to tradition. Mirei said that fine art must be “eternally modern… If you don’t create something modern, it will never become a classic.” This is something that I think about, and also hope to accomplish. Each Major Project bowl has been signed with the initials DL and the year ‘08. For this signature engraving I use a single cut kolrossing technique derived from northern European folk art. As with the 2007 work, the signature on each Major Project bowl made in 2008 is also numbered using inset copper studs located near the DL initials and the year. The number of studs indicates the bowl number. They are set in clusters of 1 – 5 studs. 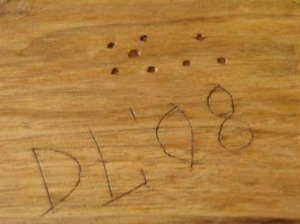 The studs are slightly inset below the bottom surface, so that they cannot scratch a table top. Purchase of Major Project bowls includes a signed Certificate of Provenance and an identifying photo CD. As with the 2007 work, these Major Project pieces are intended to have dual functions -- as collectors art and as special occasion serving ware. All of the 2008 Major Projects have a title, which is within quotation marks on the individual web page descriptions. Copyright, Drew Langsner. No contents of this Web Site may be reproduced without express permission. All Rights Reserved.